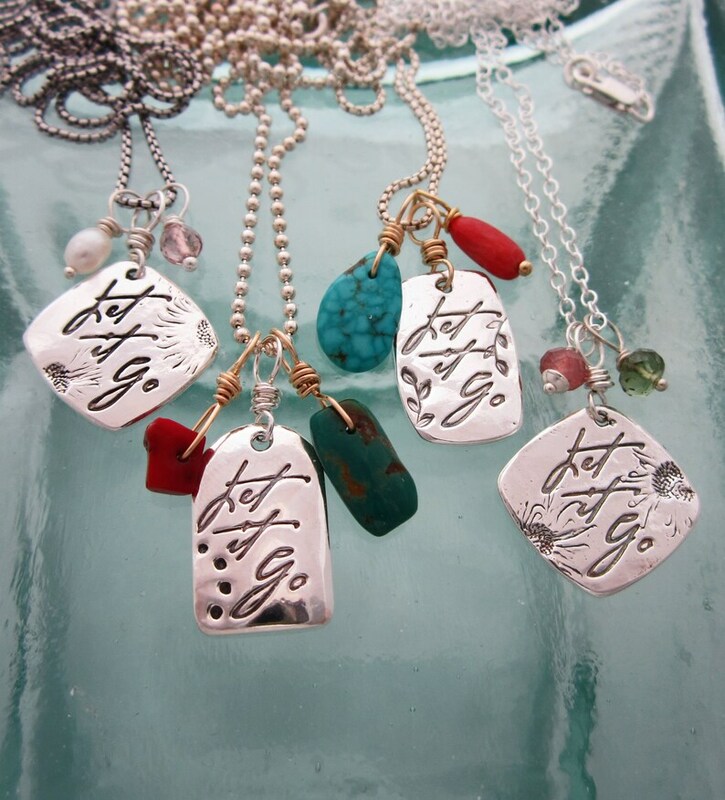 You choose one of these handcrafted silver necklaces, made by me with the inspirational words "Let it Go". A. Rounded square in shape, approx 11/16" across at widest points. This pendant has the impression from a wildflower on each side of the words, and hangs freely on the 18" round box sterling chain with one pale pink tourmaline and one freshwater pearl next to it. The pendant and beads are wrapped with sterling wire to form the bales. B. Tag shaped, approx 7/16" x 11/16" with a dot design. One each side of the pendant are one coral and one turquoise bead wrapped with gold-filled wire for a little added interest. 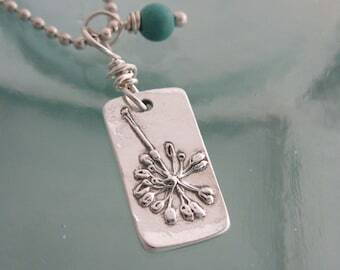 The pendant itself is wrapped in sterling wire. The chain is an 18" bead chain. C. Rounded rectangle in shape, approx 7/16" x 11/16", with sprig/leaf design. The pendant, coral and turquoise are all wire wrapped with gold-filled wire, and hang from the 18" round box chain (sterling). D. Very similar to pendant A, a rounded square shape approx 11/16" across widest points. Two little wildflowers are impressed into the silver. This necklace has a peridot and strawberry quartz bead dangling from the 18" cable chain, and is wire wrapped with sterling wire.